I prefer Our Lord Jesus Christ and His most Blessed Mother. 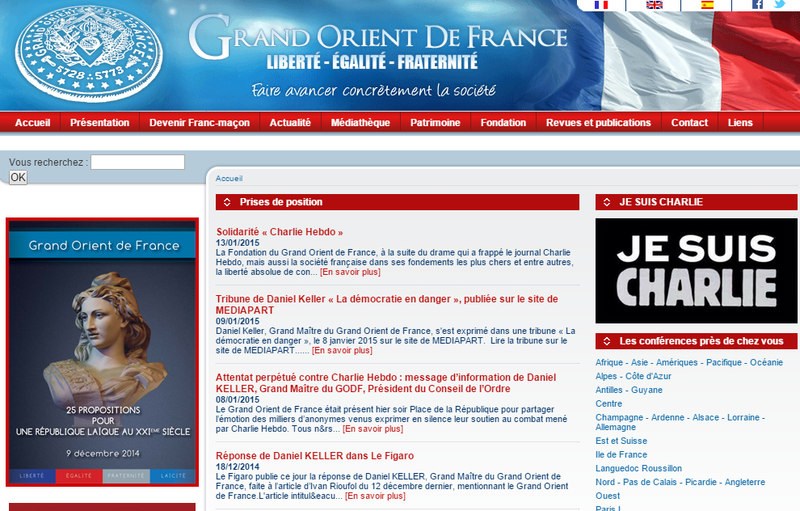 More information can be read here on the Grand Orient de France lamenting the passing of a number of brothers who were prominent in the revolutionary, libertine and blasphemous, "Charlie Hebdo". "...above all others a certain sect of darkness is engaged, a sect which human society these many years carries within itself and which like a deadly poison destroys its happiness, its fecundity, and its life...all will recognize in these traits the society of Freemasons...Full of the spirit of Satan who, according to the words of the Apostle, knows how to transform hinself at need into an angel of light, it gives prominence to its humanitarian object, but it sacrifices everything to its sectarian purpose... it exercises the most profound action on the legislative and administrative life of the nations, and while loudly professing its respect for authority and even for religion, has for its ultimate purpose the ...destruction of all authority as well as of the priesthood, both of which it holds up as the enemies of liberty". Leo XIII, Review of the Pontificate, 1902.